Firefighter Details Front Lines of San Diego Blaze As fires continue to ravage Southern California, few are more destructive than the San Diego County Harris fire. Capt. Martin Johnson, a California Fire spokesman fighting the Harris fire, talks with Michele Norris about what life is like for a firefighter on the front lines. As fires continue to ravage the Southern California landscape, few have proven more destructive than the San Diego County Harris fire. Capt. Martin Johnson, a California Fire spokesman currently fighting the Harris fire, talks with Michele Norris about what life is like for a firefighter on the front lines. 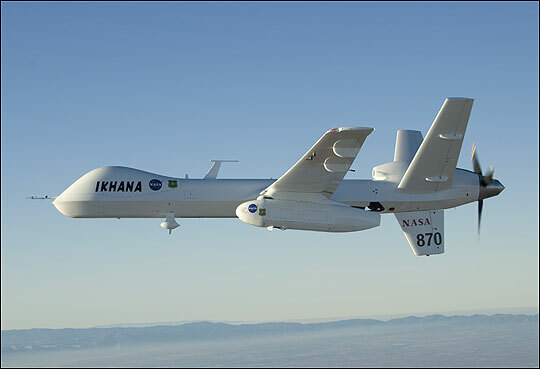 NASA's remotely powered Ikhana drone soars over smoky terrain late this summer. Infrared sensors on the Ikhana drone can penetrate smoke and relay crucial data about the fire. Fire crews battling the wildfires sweeping across Southern California have been joined by a new colleague: a pilotless plane based on military technology. Onboard infrared sensors will relay data about the fires, via satellite, to firefighters on the ground. The drone is called the Ikhana, which means "intelligent" in the Native-American Choctaw language. It's 36 feet long and is controlled by technicians at Edwards Air Force Base in the Mojave Desert. Thermal imaging isn't new — the technology has been around for some 30 years — but mounting the sensors on drones is a much more recent development. It was first used last year in California. This will be the drone's most important assignment to date. The advantage of the drones is that they can stay airborne much longer than conventional aircraft — up to 20 hours, says Everett Hinkley, program leader with the U.S. Forest Service's Remote Sensing Applications Center in Salt Lake City. 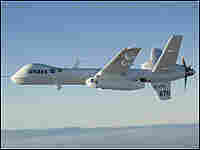 The Ikhana drone is a version of the Predator drones used by the U.S. military overseas, he says. The infrared sensors can penetrate smoke and relay crucial data about the fire — size, intensity and the direction it's moving — to firefighting crews on the ground. "They produce daily maps for the battle plan," says Everett. 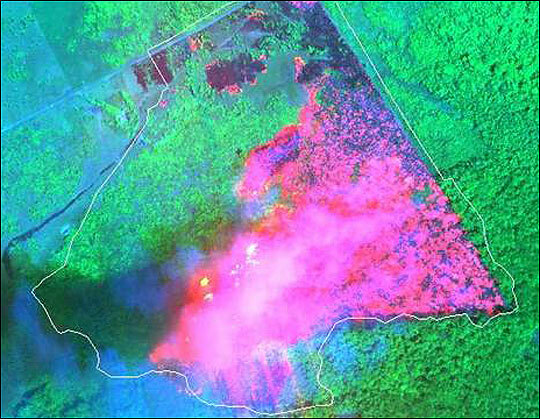 "It's extremely useful information, and you can do this through the smoke, which is a big advantage," adds Compton Tucker, a senior Earth scientist with NASA. Those involved in the fire sciences, as the field is known, distinguish between strategic and tactical information. 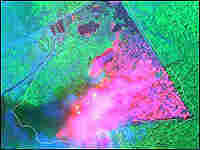 Satellites provide broad-brush strategic information about the fires in a given area. But the satellites pass overhead only twice a day. That makes them of little value to firefighters battling fast-moving blazes, like those currently burning in Southern California. Airplanes, and now drones, provide much more useful, real-time information. Other technological advances also help crews contain wild fires: C-130s, the military cargo plane, have been refitted with side-mounted water-cannons that shoot precise streams of flame retardant. A newly designed intake hose for helicopters can douse fires with 2,000 gallons of water slurped in 30 seconds from ponds, rivers and the ocean. 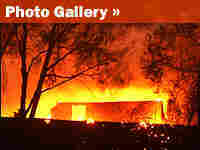 One of the more promising technologies, still in the research stage, is "fire-behavior modeling." The idea is to measure the "fuel content" of a forest — in other words, how much timber and brush is in the path of a fire — and then determine in which direction, and how quickly, it's likely to grow. Despite these advances, the basic strategy of fighting a wildfire has not changed in decades. Firefighters try to encircle the fire and cut it off from fuel sources — to starve the fire — while dousing it from the air with flame retardants. It is labor-intensive, exhausting and often dangerous work. Last year, five firefighters were killed battling a Southern California mountain fire. "Fundamentally, the way we go about putting out fires is the same as it was 70 years ago," say Murry Taylor, a former firefighter and author of Jumping Fire. "Yes, we have better tools, the fire engines are bigger, the crews are better trained and the aircraft are more modern. But we're dealing with Mother Nature, and she dances a mean boogie." Thermal imaging is helpful, says Taylor, but he doubts it will be of much use in battling the rapidly moving wildfires sweeping across Southern California now. "It's valuable data where the weather is not too extreme, but when it gets into this situation now, it's worthless," he says. "In five minutes, the data won't be worth a damn."